This ship, the first of three to carry the name, was built by Fairfield Shipbuilding and Engineering Co. at Glasgow. 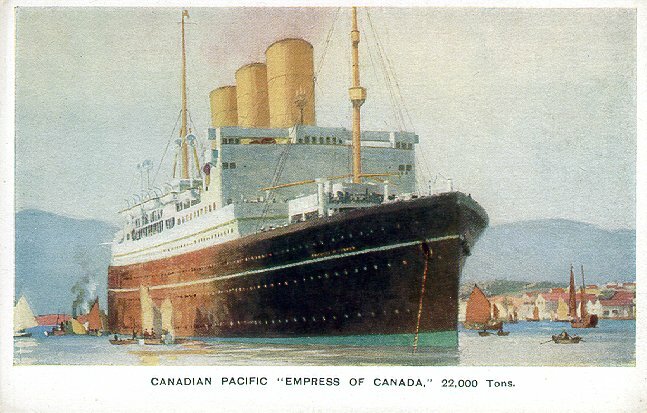 Launched in 1920, she was the first significant addition to Canadian Pacific's fleet after the disruption caused by World War I. 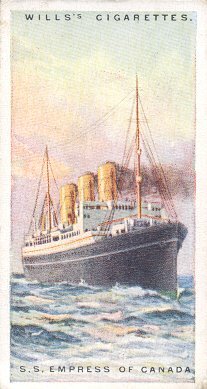 She left Falmouth on her maiden voyage, to Vancouver by way of Suez and Hong Kong, on 5 May 1922. 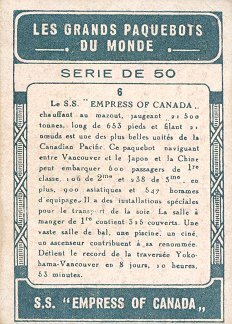 From Vancouver, she entered Canadian Pacific's transpacific service to Japan, China and Hong Kong. 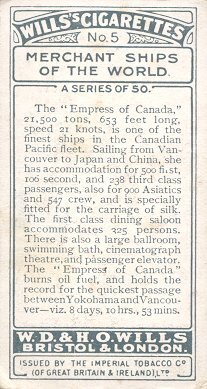 In 1924, Empress of Canada made Canadian Pacific's first Round-the-world cruise, out of New York. 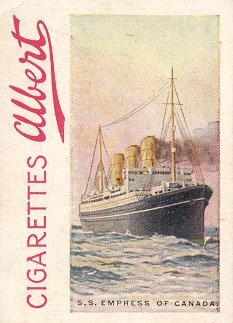 In 1928, she returned to her builder to have her double reduction turbine engines replaced by single reduction turbines. This increased her service speed from 18 knots to 21 knots. 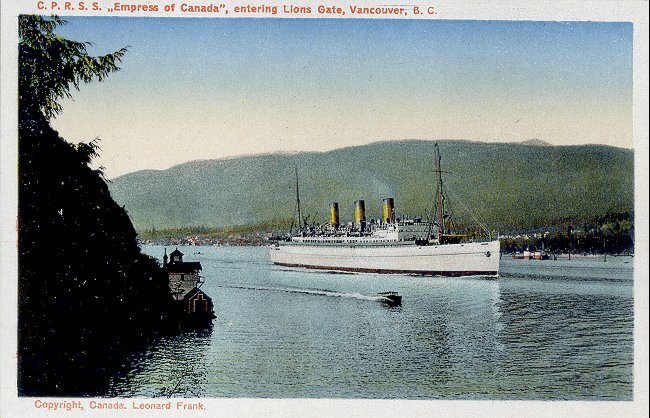 After this work was completed, she made one roundtrip from Southampton to Québec before returning to Vancouver via New York and the Panama Canal. 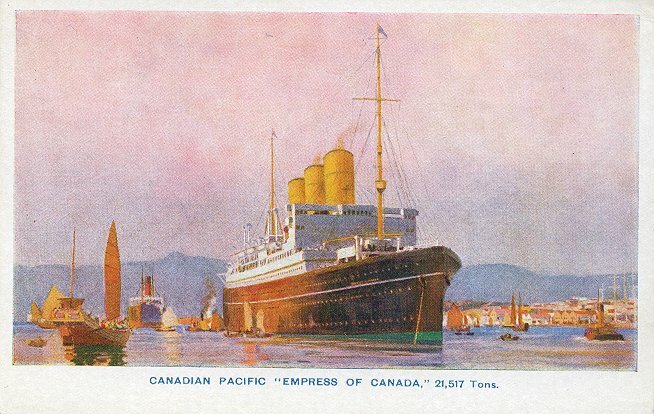 In November 1939, after 200 Pacific crossings, Empress of Canada was requisitioned for trooping. 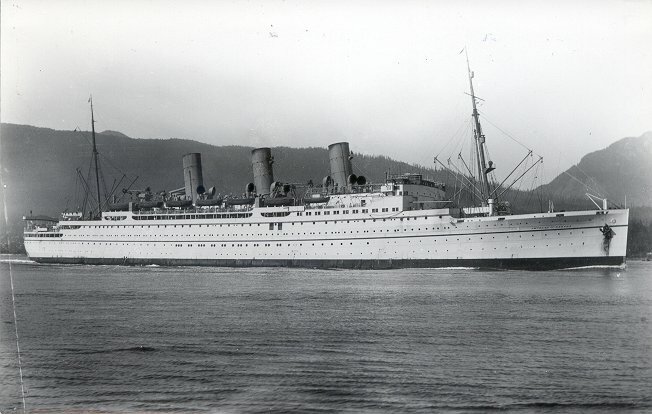 On 1 March 1943, she left Durban with about 1800 people on board, including 400 Italian prisoners of war and 200 Poles who had been released by the Soviet Union after Germany invaded. On the night of 13-14 March 1943, she was torpedoed twice by the Italian submarine Leonardo da Vinci about 400 miles (640 km) south of Cape Palmas and sank within 20 minutes after the second attack. 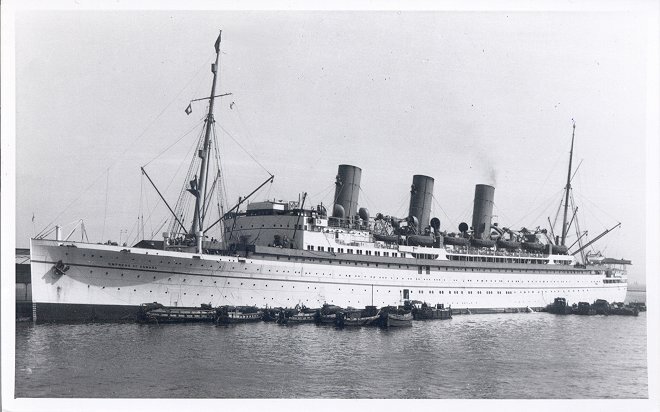 There were 392 fatalities: 340 passengers, including a majority of the Italian prisoners, 44 crew and 8 gunners. 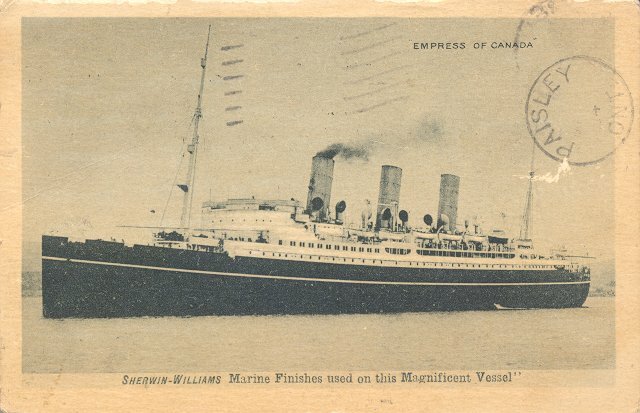 The survivors were taken to Freetown and, from there, resumed their trip to England on Mauretania.